Eighteen-year-old Shaedon Wedel had been carefully plotting his “promposal” since the beginning of the school year. From the time of day right down to the line he was going to use, the Kansas teen thought about all the ways he could make 15-year-old Carlie Wittman, who has Down syndrome, feel special. And it’s safe to say, last weekend, the Newton High School senior did just that. Her dad stood behind her, encouraging her to take a closer look at Wedel’s shirt. As she read Wedel’s shirt out loud, she realized what he was asking, and started tearing up. 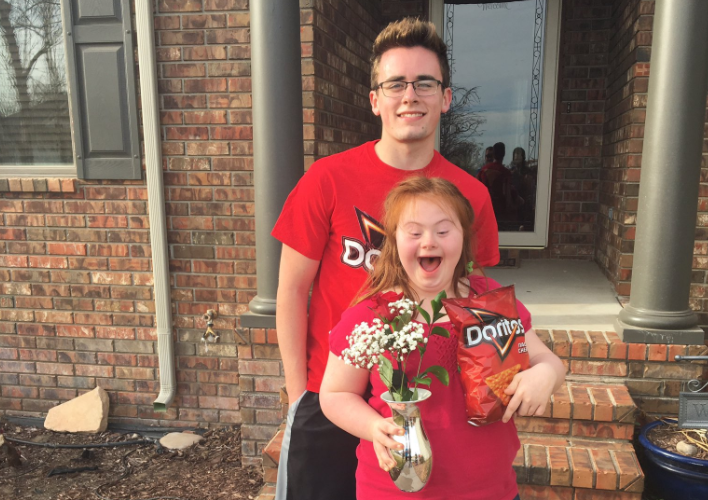 “Will you go to prom with me?” Wedel asked, handing Wittman a bouquet of roses and a bag of Doritos. It may have seemed like an unusual way to ask someone to prom, but Wedel said it fit Wittman’s personality to a tee. Having known her older brother Carson for 7 years, Wedel said he thinks of the Wittmans as basically his second family. “They have been so kind and nurturing to me,” he said. So Shaedon didn’t have to think twice about who he would bring to prom his senior year. Of course it would be Carlie. I have a Prom date with one of the sweetest gals out there! Wedel shared a minute-long video of the “promposal” on Friday, and within hours it went viral with more than 22,000 views. Dozens of people commented on his post, praising the young man for his sweet act. “You are an awesome most thoughtful young man,” one Facebook user wrote. But Wedel said it was a no-brainer to take “one of the sweetest gals” he knows to the dance, which is coming up on April 22.